Rubenerd: #Anime A new K-On character with a… tuba!? 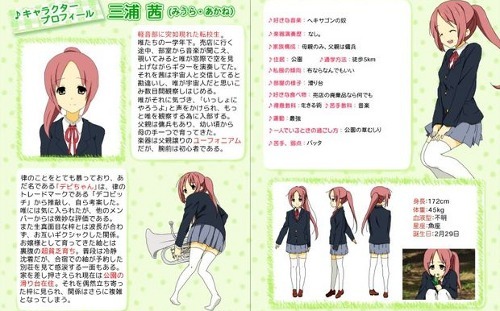 #Anime A new K-On character with a… tuba!? In case you needed another reason to obsess over the up and coming second season of the moe-blob-but-still-awesome music anime K-On, there's going to be a new character called Miura Akane-chan. 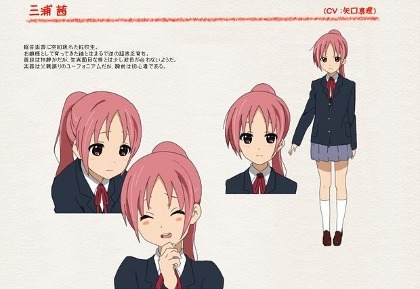 She's going to be 172cm tall which would make her tower even over Mio, and get this: she's going to play the tuba! I'm really interested to see how they fit a tuba into a pop band, I mean, it's a gigantic tuba! A… tuba!? It probably weighs more than she does! Wait, hold on, let me see if I've got this straight: a… tuba!? To tell the truth, if they were going to introduce a new character I would have been more excited if he was a guy, someone like Kyon to be mock horrified at their afternoon tea and complain they never get any work done. ;). That reminds me, I only got up to watching episode 08, and I only blogged up to episode 06. I'd better rectify this before someone with a tuba comes along. A… tuba!? While I think of it, she also reminds me of someone, but I can't quite put my finger on who. Well I suppose that's a good thing, otherwise I'd be arrested. Newer post ← PartedMagic failed? Use an old Knoppix CD! Older post → Beware the wrath of @DaveWiner !